Flourless brownies are rich and fudgy chocolate brownies made with pantry staples. No unsual or hard-t0-find ingredients necessary to make this easy recipe! 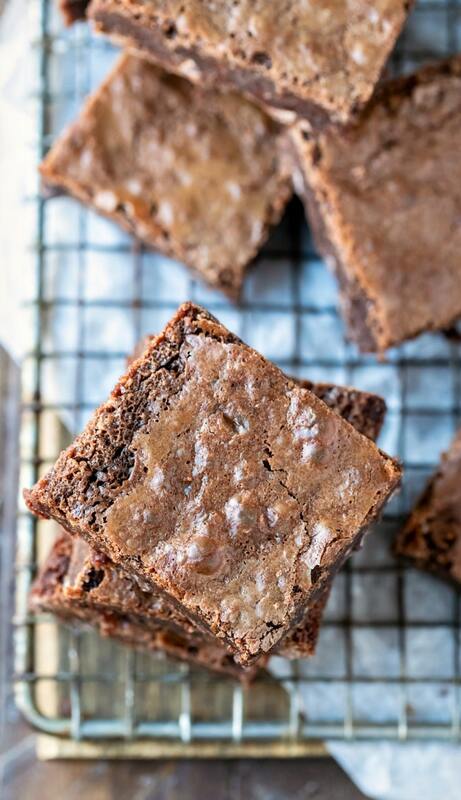 These flourless brownies are all the things that a brownie should be. 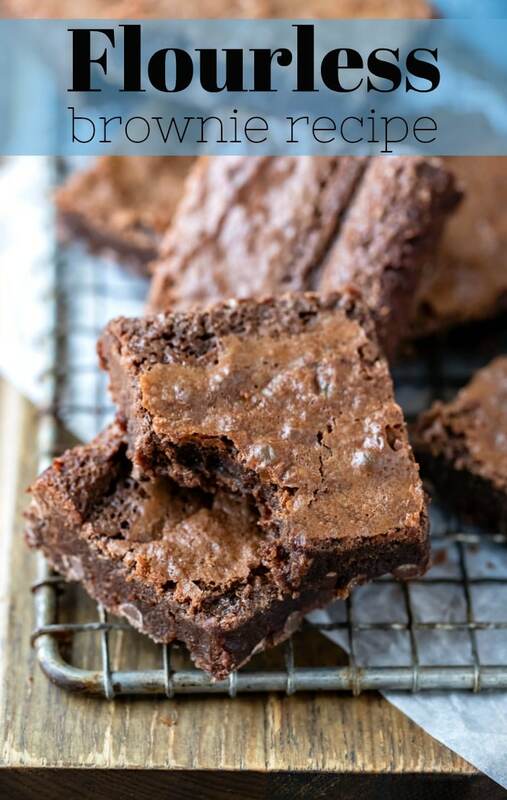 They’re easy to mix up, they’re rich and fudgy, and they have that delicate crackly brownie crust on top. They are also made with simple pantry staples that you probably already have on-hand. So, there’s no need to go out and track down 10 different ingredients (that you may never use again) in order to make these brownies. 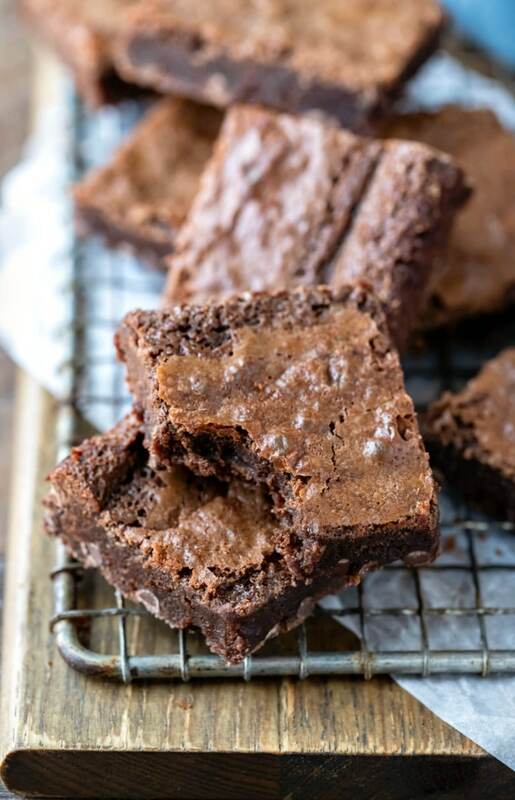 One of the great thing about these brownies is that they’re made like a simple one-bowl brownie, but cornstarch stands in for the flour in this recipe. Begin by melting the butter in a large, heavy saucepan. You’ll want to use a large saucepan because you can make the entire recipe right in the pot. Next, stir in the cocoa powder until combined. Then, stir in the sugars and vanilla until combined. Add the eggs, and mix until combined. Next, add the cornstarch and salt, and whisk in until just combined. Don’t overmix. Finally, fold in the chocolate chips. I like to use mini chocolate chips, but you can use regular or even jumbo chocolate chips if you prefer. I use semisweet chocolate chips, but bittersweet or milk chocolate chips would also work. Pour the batter into the prepared pan. I just grease the pan, but you could line with parchment paper if you prefer. It makes it a little easier if the pan is lined with parchment paper if you are going to freeze them for later. Bake until the edges are set, and a toothpick inserted in the center comes out with fudgy crumbs. It shouldn’t be wet like batter, but the toothpick should have a few fudgy crumbs attached. If the toothpick comes out clean, the brownies will be overbaked. Well, there are a number of reasons why you might want to make gluten-free brownies. If you need these brownies to be gluten-free, they should be as-written. However, it’s always a good idea to check your labels to ensure that the ingredients don’t contain any hidden gluten. These brownies are delicious – gluten-free or not! These are great brownies, not just great-for-a-gluten-free-brownie brownies. Flourless brownies are rich and fudgy and gone in about 2 seconds when I make them. They are also super easy! They come together in the time that it takes my oven to preheat, and the hardest part is waiting for the brownies to chill before eating them. These flourless brownies are also a great recipe to have just in case. If you don’t need to eat gluten-free, chances are that at some point, you may need to make a treat for a friend, family member, or co-worker who can’t eat gluten. Also, these brownies are great made ahead of time! They keep well in the fridge or freezer. Do I have to chill the brownies? You don’t have to, but they won’t be as rich and fudgy if you don’t chill them before cutting them. 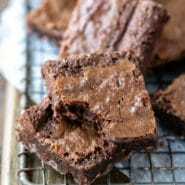 How do I know when the brownies are finished baking? 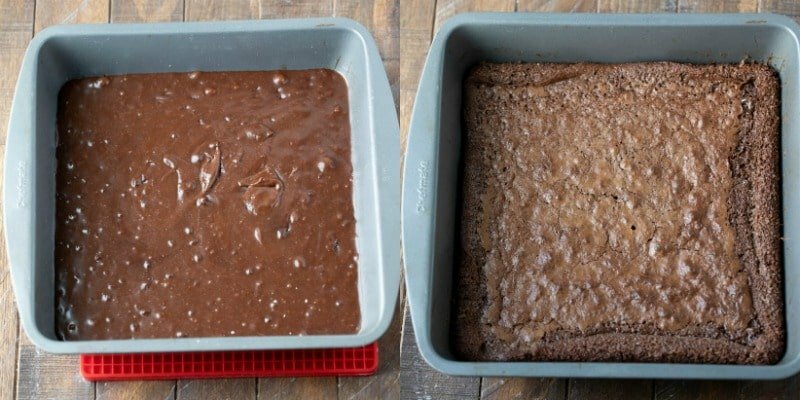 The brownies should still have fudgy crumbs attached. If you bake until a toothpick comes out clean, they will be overbaked. 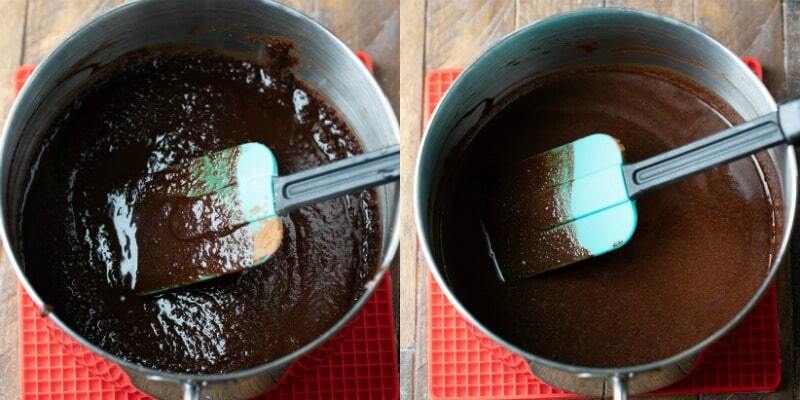 If you would like more tips for baking brownies, check out my how to make brownie post. How long will the brownies keep? The brownies will keep, covered, at room temperature for up to 3 days. They will keep, covered, in the fridge for up to 1 week in the freezer for up to 6 months. 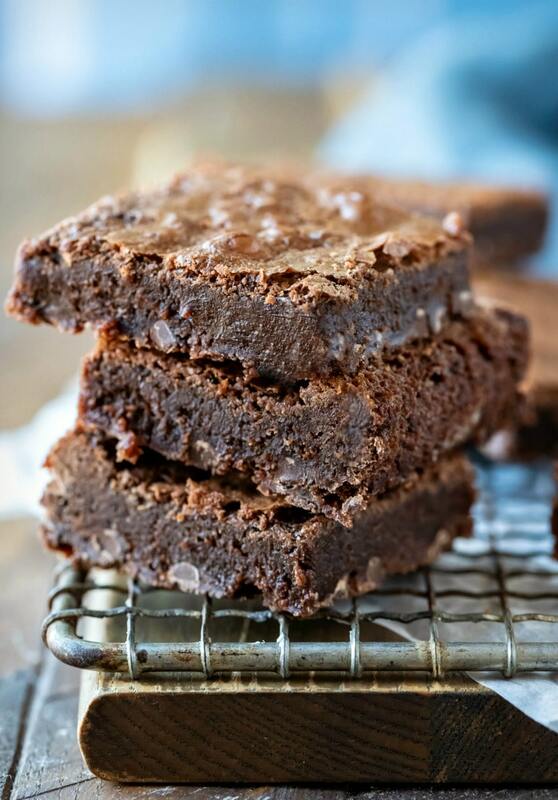 If you’ve tried this flourless brownie recipe, don’t forget to rate the recipe and leave me a comment below. I love to hear from people who’ve made my recipes! You can SUBSCRIBE to receive my latest recipe newsletters or FOLLOW ME on FACEBOOK, INSTAGRAM and PINTEREST for even more delicious food. Flourless brownie recipe made with pantry staples. Check out the step-by-step photos and tips above the recipe. Preheat oven to 350 F. Grease an 8-inch square baking dish. Set aside. 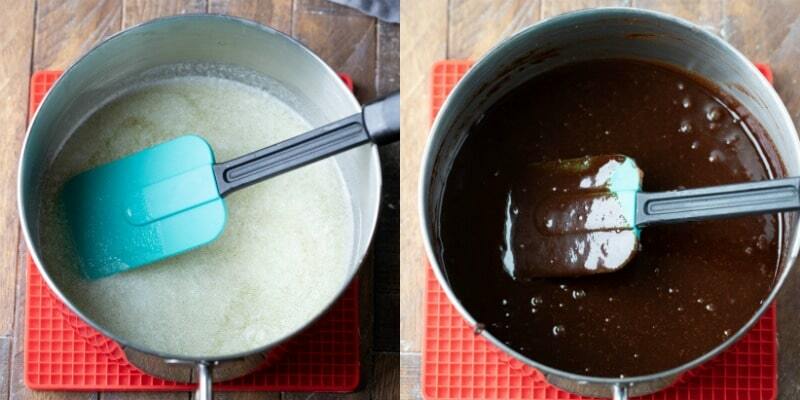 Melt butter in a large, heavy saucepan over low heat. Stir in cocoa powder until well-combined. Remove from heat, and stir in sugars and vanilla. Add eggs, and stir in. Stir in cornstarch and salt. Pour into prepared baking dish and smooth top with a spatula. Bake until edges are firm and center is just set, about 25-30 minutes. A toothpick inserted in the center should come out with fudgy crumbs attached. Do not overbake. Let cool in pan to room temperature. Place, uncovered, in freezer for at least 1 hour before cutting and serving. Can sub regular chocolate chips. If you need the brownies to be gluten-free, be sure to check the labels on your ingredients to ensure that they are gluten-free. OMG!!!! These brownies are un-real! My brownies never come out but there were the bomb!